You want to make something that looks and sounds fantastic. You try to remember every detail. No awkward moments. No dropped tasks. You’re doing your best, and when you hire a production company, you want someone who cares as much as you do. When you’re designing a space or event you care about, Arch City Audio Visual is your first call for audio, lighting, and video solutions you can be proud of. At Arch City, we believe high-quality production goes hand-in-hand with an attitude of professionalism. Our creative and knowledgeable staff knows how to listen and execute your vision. And when a problem arises, you can turn to Arch City technicians for solutions, not excuses. Founded in 2009 by industry veterans Mike Barton and Robert Scahill, Arch City believes in matching cutting-edge gear with personal consideration. Our technicians have a keen eye (and ear!) for detail. They also know how to work inside your culture. Your staff, volunteers, and guests will feel at home in their presence. No matter the size of your space or event, Arch City can scale our systems to meet your needs. • Audio: From top-of-the-line sound systems to passionate mix engineers, we’ll help you sound your best. • Lighting: We stock modern fixtures of all types. We can match your imperatives with designers who know how to create the perfect atmosphere. • Video: Using high-quality projection and beautiful LED screens, we can make your video or multimedia presentation pop. • Installation and Integration: We design audio, lighting, and video systems for your space that work together seamlessly and reliably, year in and year out. Whether you need sound, lights, or video, we’d love to help find solutions for you. Whatever your environment, Arch City Audio Visual has the experience and the gear you need to create something amazing! 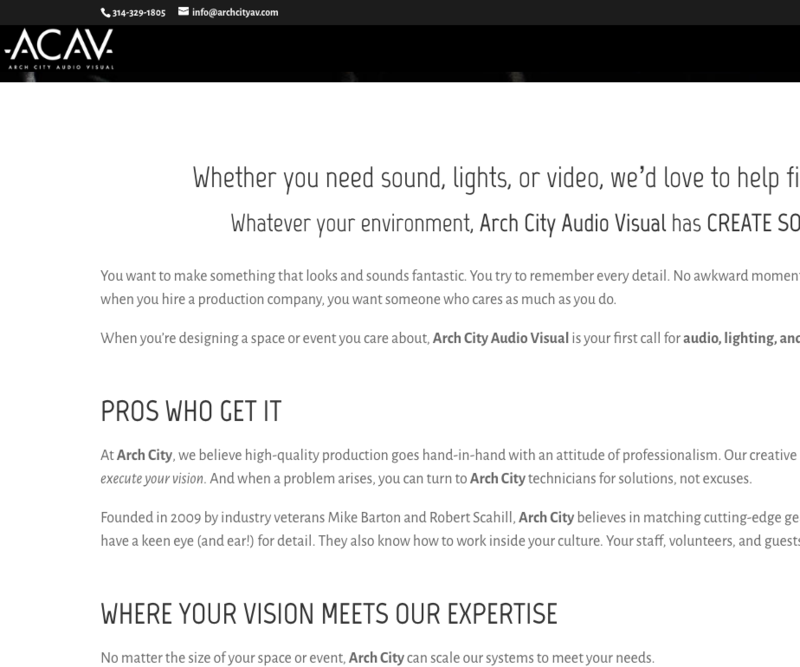 Contact us right now: (314) 329-1805 or email Michael@ArchCityAV.com.